While massive gorges like the Grand Canyon are generally long and wide expanses of alluvial erosion caused by river debris cutting down through less resistant rock, slot canyons – or narrows – are very slim, twisting passages through the rock. 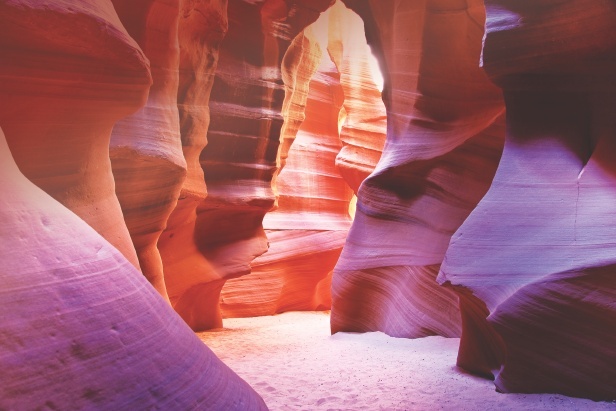 Antelope Canyon’s vertical, winding walls were carved by fast-flowing flash flood waters. The floods carried abrasive sand, rocks, logs and other debris picked up by the sudden torrents. Over millennia, these floods sculpted natural corridors through the soft sandstone. While these deep fissures can measure just centimetres across in places, due to the fact that sea level was once much lower in the region they can be as steep as several hundred metres. But that isn’t to say that the canyon is a dark, dank grotto. Indeed, when the Sun is overhead, brilliant shards of light illuminate the base of the canyon to reveal the soft, dry sandstone’s many different layers of pink, red and orange. Next story What is electricity? Previous story Why does hot water wash grease away easier than cold?